When I say “big” I'm not referring to the population or the number of high-rise buildings in our downtown area, but I'm basing my judgment on national popularity, corporate interest, and travel statistics. In the last year, Louisville has been recognized in several top rankings, being called things such as “The Most Livable City In America” by the U.S Conference of Mayors, “The Best Place to Retire” by U.S News and World Report, and my personal favorite, the “Manliest Town in America” by GQ Magazine. Louisville’s popularity in rankings and recognitions is at an all time high gaining interest from every angle including food, tourism, and community. Louisville’s well-rounded popularity is making it look like a big city to me. Corporate interest in the city is also at an all time high. With the addition of the KFC Yum Center in 2010, corporations are finally looking at Louisville as a “big city.” When Anthropologie, a huge National chain, came to Oxmoor Mall in 2010, female shoppers were ecstatic. The retail excitement is buzzing again with the recent news of the trendy and affordable clothing chain H&M coming to Oxmoor Mall in the near future. To make room for the new H&M, Oxmoor Mall officials just announced they will be doing a complete overhaul of the mall’s mezzanine and food court as well. Not all the corporate retail chains to recently come to Louisville have been welcomed with as much excitement. Urban Outfitters moved in to the Highlands neighborhood in June of 2012 and was met with some major hostility from the community. The Highlands is a “shop local” kind of place and the big dogs that moved in seemed to urk everyone around them. The store is still open and doing very well, but it just goes to show, other might want Louisville to be big but Louisville just might want to stay small. Louisville was named the “Top Travel Destination of 2013” by Lonely Planet. WIth the NuLu District producing amazing food from a variety of new restaurants and Downtown Louisville's paradox of immense history and brand new development, Louisville has never had so much to offer it’s visitors. The fact that we were named the number one top place to go makes us a “HUGE” city. Louisville will always be a special town no matter how big it gets. The community is what makes Louisville a unique city and that will never change. I’m still not ready to call my hometown a “big city,” although I’m afraid we are on our way. I know I need to embrace it, but give me a little more time. Last night, while spending some much needed down time at my neighborhood bar, the Back Door, I was surprised to find a table full of folks that looked a little out of place. Upon further review and because of the whispers around the bar, I learned that excitement was brewing in the bar over a reality star in the building. Tim Smith, a moonshining legend and star of the Discovery Channel’s hit reality show Moonshiners was sitting right in the middle of our humble Back Door. Complete with overalls and his signature khaki hat, Tim was just as lively and passionate about ‘shining in person as he appears on the show. In town for two days on a promotional tour for the show’s new season, Tim came to the Back Door to watch the new episode of Moonshiners among friends and fellow distillers. Moonshine is part of our American heritage. Although it is considered illegal, in many parts of Appalachia, there are those that choose to distill their own shine, following in the footsteps of those that came before them. The Discovery Channel goes inside the day to day life of a moonshiner and discusses their trials and tribulations. NASCAR even has it’s roots based in moonshine. The first race cars were designed by moonshiners who were constantly trying to build faster cars and become more skilled as drivers in order to escape from the law. Over time these cars were used not only to outrun the police but to race each another. Eventually these humble races turned in to what we know as NASCAR today. Kentucky has deep roots in moonshine. If you have grown up or lived in Kentucky you have most likely been in some sort of contact with illegal moonshine. I have been on several trips to Eastern Kentucky, Harlan County in particular, where although the “apple pie” shine comes in milk cartons, it sure will keep you warm on a cold night. If you don't want to travel to Eastern Kentucky to taste moonshine, or if you feel more comfortable trying the legal stuff, their is some good news for you. Along with Tim Smith, I had the pleasure of talking to Steve Beam, owner of Limestone Branch Distillery. This distillery, located in Lebanon, Kentucky, creates varieties of legal moonshine like apple pie and 100 proof Sugar Shine. The moonshine sold under the T.J Pottinger label can be bought in town at such major retailers as Liquor Barn and Party Mart. Whether you are a bourbon, vodka, or tequila, drinker, if you are from or are visiting Kentucky you have to try moonshine. Moonshine has historic and cultural meaning in this region and you can taste it in every sip. Moonshiners on Discovery channel is a great way to learn a little bit about the ongoing struggles that bootleggers still face today and is an entertaining way to gain insight into a lifestyle that not many people get to see first hand. Moonshiners airs on the Discovery Channel Wednesday evenings at 10pm. Over the holiday season, I was lucky enough to reconnect with several of my friends that currently live all over the World. Home for the holidays, and often away from the warmth and comfort of the things that remind them of home, most of my friends were eager to jump back into their old habits and looked to me to show them the way. Not surprisingly, bourbon was at the top of many of their lists. Bourbon is relatively easy to find in most places, but good bourbon and several varieties of bourbon are only found here at home. Of course, being a bourbon lover myself, I was happy to lead my friends around to some of my favorite new spots. One of my favorite nights consisted of drinks and dinner at St. Charles Exchange followed by more drinks at the bar Meat. St. Charles Exchange has a lengthy bourbon menu, but the reason I took my friends there was for the Old Fashioned. The St. Charles Exchange Old Fashioned is hands down the best Old Fashioned I have had in the city to date. The St. Charles Exchange bartenders know what they are doing; the bourbon is the star of the cocktail and every sip is heavenly. There are several other cocktails at St. Charles Exchange that feature bourbon in ways that are unique and exciting. Every time I try a new cocktail at this restaurant I am surprised by the depth of flavors. The food at St. Charles Exchange is always delicious too. The same care that goes in to each cocktail goes in to each dish. You can always count on St.Charles Exchange to put forward creative, forward-thinking, good-feeling food, and no matter what, you are always guaranteed to have a great time. After dinner, full with amazing food and slightly tipsy from our heavenly cocktails, I decided to keep with the prohibition-style theme as we headed to Meat on Story Avenue. Meat has recently been named one of the 50 best bars in the World. It is located on the second floor of the Blind Pig Restaurant in Butchertown and has a very unique vibe. Modeled after a 1920s speakeasy, Meat combines a laid back scene with a butcher’s torture chamber vibe. Meat and butcher tools hang from the ceilings adding to a playful but dark atmosphere. Meat doesn't have the best bourbon list, but it does have excellent cocktails. At this point in the night, my friends didn't care what they were drinking to be honest. The next night everyone was ready to do some real bourbon tasting. They all headed to Bourbons Bistro on Frankfort Avenue to enjoy a bourbon-inspired dinner menu and all the bourbon they could get their lips on. Bourbon’s Bistro is the place to go in Louisville for anyone trying to learn about bourbon or try new bourbons. With the longest bourbon list in town and a professional staff that knows their stuff, you wont leave disappointed. Most restaurants and bars in Louisville have a decent bourbon list, but if you want to find which restaurants have lengthier menus, a good way is to follow the Urban Bourbon Trail. You can visit louisville.com to find all the restaurants participating. If you want to take it a step further, you can grab an Urban Bourbon Trail “passport” and collect stamps at each restaurant you visit. After you collect six stamps you can receive a free gift. Bourbon makes my friends feel at home and I couldn't have been happier to celebrate it with them. There are so many other wonderful places I could have taken them if only we had more time. We are so lucky to have a city filled with excellent restaurants and delicious bourbon cocktails, so get out there and enjoy them! One of my favorite go-to gifts to give my close family and friends is a personalized calendar complete with meaningful photographs and reminders of special events. My family in particular is so large that before my calendars no one could remember each other’s birthdays. Embarrassing belated birthday calls had become the norm for my family, and it was becoming a problem. Now, every New Year, my family members look forward to receiving the newest edition of my calendar because without it they would be lost. These calendars are not only excellent gifts to give someone else, but make personal organization beautiful enough to hang on the wall. There are several websites that make creating calendars like mine, very simple and inexpensive. My favorite website is Shutterfly.com. All you need to know before starting your calendar are the special dates you want to include and what photos you would like to feature in your calendar. Shutterfly will walk you through step by step in creating your calendar and make it utterly fool proof. You can create all different kinds of calendars, like desk and poster calendars, starting at $9.99 per calendar. Wall calendars start at $21.99 but there are always sales and coupon codes available so make sure you take advantage of them! Many people don’t realize when they are reciting those happy words, that they originated right here in Louisville, Kentucky. Yes, it’s true, the same “Happy Birthday” that has been translated into numerous languages and is sung all over the World to celebrate Birthdays around the globe, was written by two Louisvillians. Mildred Jane Hill and Patty Smith Hill, who are both buried in Louisville’s Cave Hill Cemetery, are credited in 1893 with writing the very first version of “Happy Birthday to You.” Next time you are Downtown, drive by 920 West Main Street and check out the “Happy Birthday Lot”, a parking lot named after one of the top three most famous songs in the English language. Louisville is filled with inspirational people and fun historical facts. Our city has clues to these interesting facts all around us, we just have to learn to open up our eyes and look for them. Next time you attend a birthday party and sing those famous “Happy Birthday” words, maybe you will sing them with a little more pride! Everywhere you look in Louisville, whether it be in our local boutiques, at our various art fairs, or throughout our historic architecture, a similar theme can be noted; the fleur-de-lis. The fleur-de-lis is the city of Louisville’s official seal and more importantly, has become our cultural icon for Louisville’s close knit community. Most Louisvillians know the importance of the fleur-de-lis to Louisville, but may not necessary know why. In the United States, the fleur-de-lis is most famous for being the official seal of New Orleans. Following Hurricane Katrina, the fleur-de-lis took on another job as promoting grassroots support to the recovery. So how did the fleur-de-lis become the official seal of Louisville then? The fleur-de-lis is a french symbol with it’s earliest uses in the French Monarchy. It’s questionable whether or not the fleur-de-lis is modeled after an iris, a lily, or it could be a holy trinity. The fleur-de-lis became the official seal after the Revolutionary War to represent the french aid given to Louisville and subsequently, Louisville was named after King Louis XVI. Because of Louisville’s roots, it is in fact pronounced “Louie-ville,” but try to say it that way around town and you will get plenty of eye rolls. If you are proud of living in Louisville, or like our beloved city, then hop on the fleur-de-lis train if your not already on it. Fleur-de-lis jewelry, home goods, and even fleur-de-lis inspired businesses are easy to find around town. Regalo, Scout, and Why Louisville are just a few of the locally owned boutiques that carry fleur-de-lis jewelry and accessories for the home. Some of the most popular fleur-de-lis merchandise range from serving platters, tea towels, to ice scoops. Sterling silver fleur-de-lis jewelry is also very popular. Fleur-de-lis earrings, watches, and necklaces are a great way to show your Louisville pride while looking modern and stylish. Regalo is located on Barret Avenue, Scout is part of the Nulu District, and Why Louisville is located on Bardstown Road. Many local businesses have taken on the fleur-de-lis name and symbol to market to the local community. Restaurants such as the Fleur De Lis Cafe on Bardstown Road serve the local community with comfort food in a casual atmosphere. Fleur De Lis Events and Design is a high end special events company that specialize in making everything from the lighting to the floral arrangements on your special day beyond perfect. The fleur-de-lis name is even being used in the local real estate industry. Fleur De Lis on Main is one of the newest downtown residential and commercial developments. Complete with 82 condos, and over 20,000 square feet of retail and commercial space on the first floor, Fleur De Lis on Main is making a big mark in the every changing downtown community. If you didn't know the history of the fleur-de-lis in Louisville, now you do. Fleurs-de-lis are beautiful and meaningful symbols but what makes them more meaningful is what we have done with them as a community. Louisvillians love using the fleur-de-lis to show pride in our city and I encourage you to jump on board. It seems as though our beloved secret city is becoming a little less secret these days. For years, Louisville has been our hidden treasure of a town. Besides visiting for the Kentucky Derby, most travelers and those outside the inner Louisvillian circle, would never consider Louisville a place to visit and especially not live in year round. Recently however, with the revitalization of many downtown neighborhoods and the ongoing growth and expansion of central downtown, Louisville is becoming a popular destination for many visitors. Lonely Planet, the World’s most successful travel publisher, has named Louisville the number 1 top US travel destination for 2013. Lonely Planet’s editors and authors fell in love with Louisville’s multicultural neighborhoods and offbeat charm while doing their research for the top ten list. 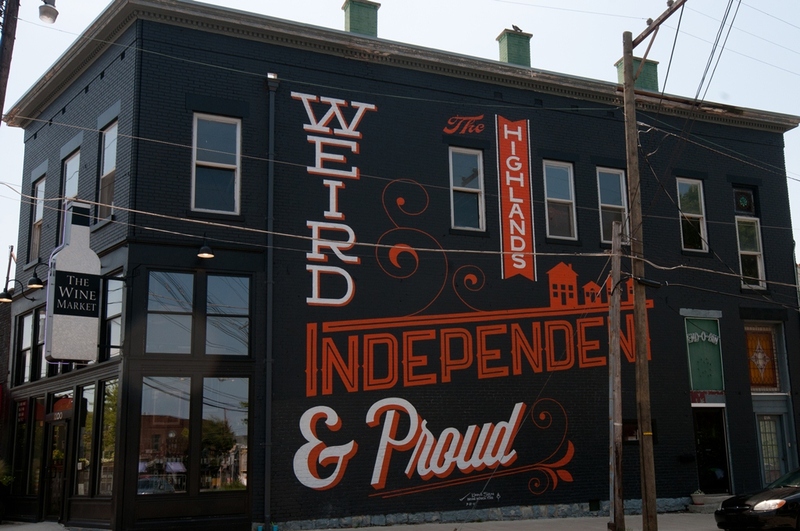 The NuLu/East Market District, Urban Bourbon Trail, and the Highlands neighborhood were three aspects of our city that Lonely Planet claimed put us at the top. Anyone who visits our new Louisville can see that it is alive and vibrant, filled with good food, friendly people, and beautiful architecture. Louisville has a thriving art community, a diverse cultural community, and a passionate college sports community. Louisville is not only full of incredible travel options for a weekend, but keep all of what the city has to offer in mind if you are considering Louisville as your permanent home. There is a reason Louisville earned Lonely Planet’s number one spot. Louisville and it’s surrounding areas are full of day trips and family friendly activities for out-of town visitors or locals who want to spend a day out of the house. The Falls of the Ohio State Park is located just across the bridge in Clarksville, Indiana. The expansive limestone shelf holds fossils dating back 400 million years. The limestone shelf and accompanying museum are considered one of the areas most important landmarks. Other museums and day trips in the area include the Louisville Science Center, Louisville Zoo, JB Speed Art Museum, and the Louisville Slugger Museum where they craft the official bat of Major League Baseball. Louisville also has annual car, craft, neighborhood, arts, music, and cultural shows that pop up year round. Louisville is a city with amazing architecture.It is only second to Boston on the “National Register of Historic Places,” and second to New York City’s SoHo in buildings with cast iron fronts. The Downtown Louisville neighborhood of Old Louisville has the largest assembly of Victorian mansions in the country. Walking tours are available to take through community, and I highly recommend going. There is so much to do in Louisville that it is no surprise that it is number one on anyone’s list. I have always known how great this city is and that it was only a matter of time before other people started to catch on. Now we have to worry about everyone else trying to get in on our wonderful secret city. Fall is the perfect time to get outside and enjoy the last days of bearable weather before the harsh Winter sinks in. In fact, these next few weeks when there is a chill in the air and the last leaves are falling off of the trees, are the best days for bundling up in your cold weather gear and heading out to your local parks for some fun. This is my favorite time of year for enjoying the many outdoor amenities that our city has to offer. These days spent playing outside not only bring with them the obvious excitement of a day at the park but often lead to some of the best memories. St. Matthews has several parks within the community. The heart of the St. Matthews neighborhood is the award winning Brown Park. Brown Park holds many of the community events such as next month’s Light up St. Matthews and the recent 15th annual St. Matthews Halloween Festival that was a huge hit. When Brown Park isn’t hosting a huge neighborhood blow out, you can always find someone you know at the park using it’s many amenities. Brown Park has beautiful asphalt walking trails through the woods and next to Beargrass Creek, creating scenic but walkable paths. There is a pond on the East side of the park that has become the home of several species of wild duck. Children love to come to the pond and check out the ducks. Although there are posted signs saying not to feed them, I have seen many Grandmas allowing their happy grandsons to throw the ducks some crackers. Brown Park is also equip with playgrounds, picnic tables, barbeques, and a large pavilion for entertaining. Seneca Park is one of Louisville’s most popular parks and is right on the outskirts of St. Matthews. Seneca Park was designed by Frederick Law Olmsted, the same “landscape architect” who designed New York City’s Central Park. Seneca Park is a 500 acre park that offers many amenities, including soccer fields, baseball fields, tennis courts, running paths, and an 18-hole golf course. If you are a sports lover than Community Park is the place for you to go. Community Park is a 45.8 acre park located just off of Shelbyville Road by the Ten Pin Lane Bowling Alley. Community Park is home to the St. Matthews Little League so it is filled with league quality baseball fields. In addition to the baseball fields, the park has basketball courts, tennis courts, playgrounds, asphalt walking trails through wooded terrain, and picnic tables with barbeques. This park has everything you need if you are going to watch a game with your family or if you want to play your own game! Arthur K. Draut Park is a simple park located on Bowling Boulevard just several blocks from Brown Park. This 24.2 acre park is intended for walkers, runners, or joggers and offers a scenic trail for interesting ambiance. No restrooms are offered at this park, so it is purely a place to enjoy the view. Warwick Park is located off of Virginia Avenue and has many amenities for all ages. There is an asphalt walking trail around the perimeter of the park, creating a track and open green space in the middle. Barbeques, picnic tables, playgrounds, and basketball courts are all available at the park as well as a baseball diamond that is available to be reserved for free. A large pavilion can also be reserved for large parties at no cost. All of these St. Matthews city parks are open to the public from Dawn till Dusk and offer free parking. Bundle up in your coats, hats, and gloves, and enjoy your local parks even if it is a little chilly! Pretty soon it will be so cold the only thing you will be able to do at these parks is sled! Find your dream home at St. Matthews Homes for Sale where you can search by price, size, year built or any other detail.